My last post was about the head of the Islamic Republic's Assembly of "Experts", Ayatollah Mahdavi Kani, showing off his expertise on Einstein and the theory of relativity. This picture on the left is a snapshot from the 15th official gathering of the Assembly of "Experts", the powerful body which at least on paper, is supposed to choose the Supreme Leader and make sure the leader acts appropriately Islamic. 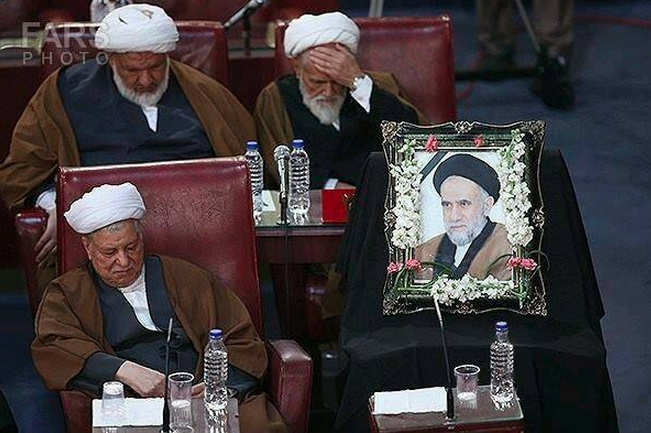 In the picture, you see Rafsanjani, the former head of the Assembly of 'Experts' sleeping. The overweight "expert" sleeping behind him is Ali Razini, the former head of the Special Court for the Clergy. Next to Razini, is Ayatollah Haeri Shirazi who is holding his head and is about to join his comrades and fall asleep any minute. Finally the picture in the front row, placed on the chair, is that of Ayatollah Khorram Abadi who has passed away but nevertheless a bottle of water is left for him, in case his spirit joins the session and gets thirsty. The Assembly of the medieval decrepit. This now typifies the Regime. No new blood. Just a bunch of oppressive and corrupt evil old men, who staggeringly still manage to hold the youth of Iran and new liberated ideas to Ransom. Come on Iran! Time your volcanic rage really caught these smug thugs sleeping, and turned them all into the dark page photographs of history! photographs!